Was Andrew Gillum 'singing a different tune' about charter schools at the Florida debate? By Amy Sherman on Monday, October 29th, 2018 at 4:26 p.m.
Ron DeSantis accused Andrew Gillum of changing his message to Florida voters about his plans for the future of charter schools. At their final debate, moderator Todd McDermott asked Gillum to elaborate on his charter school plan. "You’ve said ‘we’ve got to end this for-profit education’ in reference to charter schools in this state," McDermott said. "Ten percent of students in Florida attend charter schools that provide an alternative to traditional public education. Are you saying you would cut any dollars away from what funds charter schools in the state?" Gillum replied, "No, I am not proposing any change to the current status quo. But what we are saying is that we are going to put money into our public system where over 90 percent of our kids are still being educated." DeSantis accused Gillum of "singing a different tune." "In the Democratic primary, he said that charter schools would be done," said DeSantis, who defended the rights of parents to choose charter schools. DeSantis wants to continue many Republican school initiatives, including supporting charter schools. Gillum has been a critic of for-profit involvement in charter schools throughout his campaign. A Miami Herald investigation in 2011 found charter schools are "controlled largely by for-profit management companies and private landlords — one and the same, in many cases — and rife with insider deals and potential conflicts of interest." That distinction is at the heart of Gillum’s critique. He couches his opposition to say he is a critic of for-profit charter schools. When asked on WPTV in February if he supports the charter school concept, Gillum said "my issue is not with charters. My issue is with for-profit charter schools who take money away from the public system badly needed in the public system." 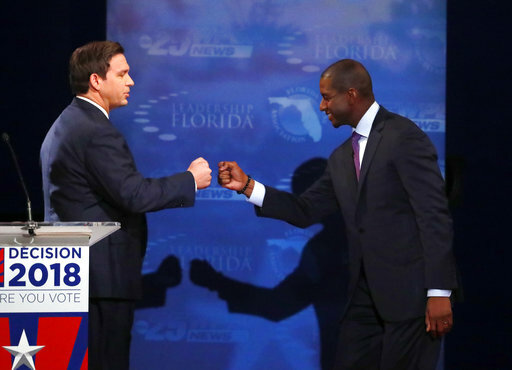 Gillum made some of his most forceful comments against for-profit involvement in charter schools in a June primary debate. "What we’ve got to do is end this for-profit regime that the Republicans have entered into the public education system here in the state of Florida," Gillum said. "We’ve got to do it immediately. ... I would be completely against for-profit charters in this state." During an August primary debate, Gillum said the governor and Legislature "have moved more and more of our public dollars out of public schools and into for-profit charter schools. We need to end that." After Gillum won the primary, he continued to criticize for-profit charter schools. In September, the AP paraphrased Gillum as stating that it was time to stop siphoning off public money into privately run schools. Gillum said he would seek to bring the state's current voucher programs to a "conclusion." While Gillum hasn’t provided a detailed road map to the steps he would take if elected to crack down on for profits, he has made it clear these schools are in his crosshairs, and he views the involvement of for-profit entities as a problem. We asked his campaign to clarify whether he would try to shutter existing charter schools managed by for-profit entities, something that would require buy-in from the state Legislature. Campaign spokeswoman Carlie Waibel said Gillum "will not shut down charter schools," saying he wants to bring them more "transparency and standards." Lynn Norman-Teck, executive director of the Florida Charter School Alliance, disagrees with a blanket condemnation of charter schools that are managed by for profit entities. For some schools, the for profit entity does back office type of work while in others they have a larger role. "We should be looking at the value of a school whether it is a district school or private school or charter," she said. "Let’s look at the return on investment -- are they reaping results? Are those children moving forward?" DeSantis says Gillum was "singing a different tune" about charter schools at the Florida debate. That was a reference to Gillum’s answer to a question about whether he would cut any dollars from charter schools. But Gillum was downplaying his previous comments on charters, saying he would not propose any change to the "current status quo." He went on to say he was "going to put money into our public system where over 90 percent of our kids are still being educated." During the primary, Gillum had tougher words. He said Florida should "end this for-profit regime" immediately, in regard to charter schools managed by for-profit entities, and he called for an "end" of moving more public dollars to for-profit charters. What DeSantis omits is that Gillum hasn’t called for an end to all charter schools — he is targeting those that are managed by for-profit entities. Published: Monday, October 29th, 2018 at 4:26 p.m.